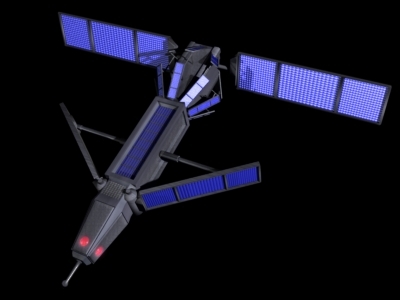 The Sysat T-24 satellite is a militarized version of the basic Sysat T-20 Reconnaissance Satellite. It is distinguished by the addition of a large, rotating rotodome containing the patented YODAR™ antenna as well as identification friend-or-foe (IFF) and data-link remote control (DENKER-C) antennas. The T-24 is renowned for it's ability to provide a comprehensive system-wide picture of a combat zone, including identifying friend and foe spacecraft, target acquisition, and communications with planetary base stations. The T-24's technical systems handle large quantities of information in real time and the factory-fitted armour plating to allow it to survive minor astronomical phenomenon (or keep transmitting long enough to report attacks on itself).